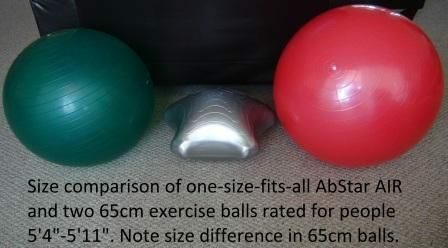 Exercise balls and other inflatable fitness products like the AbStar Core Trainer (aka AbStar AIR) were invented to add instability to workout routines. The aspect of instability requires the engagement of more muscles in continuously varying ways. Engaging those muscles are required, so the exerciser can maintain body balance and complete the exercise repetitions. One of the problematic issues with buying an exercise ball is determining what size exercise ball to buy. Consider the following size charts and sources. As you can see, there are wide discrepancies between these charts. Every manufacturer, retailer, brand and source may differ in sizing. Additionally, although height versus the size of ball seems to be a reasonable measure, one’s torso length may affect the size of ball needed more than height. For example, a person with a long torso with relatively short legs may need an entirely different size ball than someone of the same height but shorter torso. Thus, body proportions, not only height, will affect proper sizing. One solution is to try out a ball at a local sporting goods store. That is, assuming the store has enough room to inflate balls of several sizes for display and testing. Most retailers do not, but they may offer several boxes of various makes and sizes of balls. These balls may or may not have size charts, which you may or may not be able to trust. Considering the conflicting charts and information, it seems impossible to size an exercise ball properly, especially when ordering online. For instance, the featured image above shows two 65cm models flanking a one-size-fits-all AbStar Core Trainer (aka AbStar AIR). Our core trainer is, for reference, only about ten inches (25.4 cm) high. Note that each ball, though fully inflated, is significantly different in height. Those differences are likely due to different manufacturer size scales, molds, source materials and molding processes. Each AbStar Core Trainer is produced in only one factory. That factory uses special AbStar molds of the same size and shape, along with the same materials and advanced rotational molding process in every manufacturing run. With its anti-slip base, the AbStar Core Trainer stays where you put it, and it is safer, more versatile and more effective than a ball. Only ten inches high, twenty inches in diameter, and 3.5 lbs., the AbStar Core Trainer is easy to carry, move and store. Its thicker material and 400 lb. rating mean the AbStar Core Trainer offers better support for exercisers. Its design and construction make for more efficient core and stability training, while offering enough resilience for effective resistance training. Apparently, “what size” was a trick question, because the choice is clear. Use the safer, more versatile, and more effective, one-size-fits-all AbStar Core Trainer. If you enjoyed this article, you might also like our posts on how to lose body fat and how to achieve more effective ab workouts. Disclaimer: The above is the opinion of the author. Use at your own risk. As always, consult with your doctor before beginning any nutritional or exercise program.